So is it Christmas yet?? September just flew by. This month we are doing 2 weekends of retreats. I am on a board for a non-profit pregnancy center here in Seeley Lake and we have been planning a fund raising banquet in a short amount of time. That will be next week! I just spent a week in Billings visiting my parents. My dad has been having some medical issues. I went to a batman birthday party for my 4 year old grandson complete with a real life batman! We have season football tickets for the University of Montana. Hunting season is about to start. Weekends are pretty much taken up! Then it will be Thanksgiving and then Christmas is just like the next day isn't it? I love the fall but it is exhausting! It is all very fun though. One day at a time right? 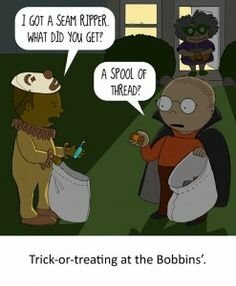 There is still time to complete this Shop Hop! Get your passport stamped at every store to be eligible for the Grand Prize drawing. 3 Grand Prizes will be awarded. First place is a Janome Sewing Machine valued at $999. 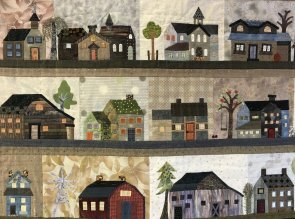 Second place is a one night of a 3 night stay free at Mountain View Retreat, a $300 value and third place is a fabric dying session for 2 people at The Cotton Patch Quilt Shop in Drummond, a $100 value. Each individual shop will also have a door prize drawing. Leave your passports at the last location you stop at or mail to Quilters Corner no later than October 17th. This is a day to get together with friends to work on any hand project of your choice. We enjoy sharing and learning from each other! I am sure black will make your scraps look thinner in this quilt! Sharon's version is beautiful in Christmas and she is starting another one in batiks that is just as beautiful! This is a fat quarter friendly quilt. Another beautiful quilt by award winning Dutch quilt artist Jacqueline de Jonge. Toni will show you how to paper piece to make perfect points using her foundation method. The pattern is $35. There will be an additional charge for Toni's foundations. Toni will continue with Becolourful patterns on the last Tuesday of each month. That is if we can tear Renee away from her new grand daughter in Chicago!! 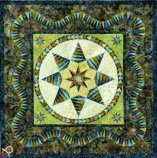 Come learn the art of needle turn applique (or fuse if you prefer) from one of the very best! Renee will be sharing all of her secrets for perfect houses. Newcomers are welcome! Book by Yoko Saito required.